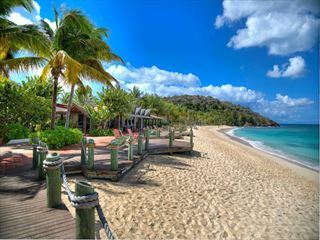 Enjoy a wonderful castaway feel at Jumby Bay, A Rosewood Resort. Nestled on a private island just two miles away from Antigua and accessed only by boat, your holiday will feel unbelievably exclusive and exciting before you’ve even stepped on the sandy shores. 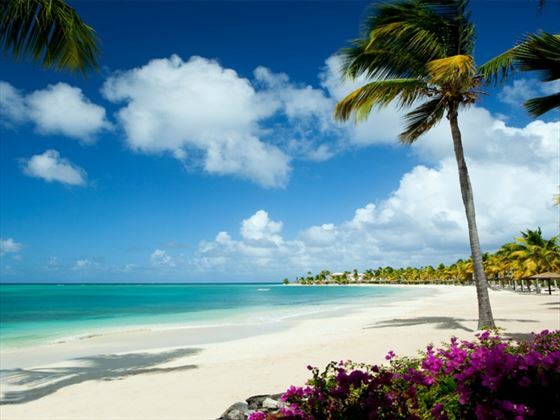 Adorned with sweeping gardens filled with tropical flora, Jumby Bay is incredibly picturesque. You’ll indulge in an authentic island experience where no cars are in sight, and all you’re left with is pristine white sand beaches, charming accommodation, sensational eateries, and a never-ending view of turquoise ocean. Grab your complimentary bike, and explore the winding tracks that lead you through the unspoilt surroundings. The Rondavel Rooms and One-Bedroom Suites are found on the western side of the island, all found in characterful octagonal-shaped cottages, whilst the Beachside Suites are an indulgent choice with their private courtyards leading on to the beach. Fancy really treating yourself? The villas and estate houses here are truly spectacular. Ranging from open-plan villas boasting expansive outdoor living spaces and private pools, to grand estate houses with their own tennis courts, this is your chance to really indulge in some luxury. 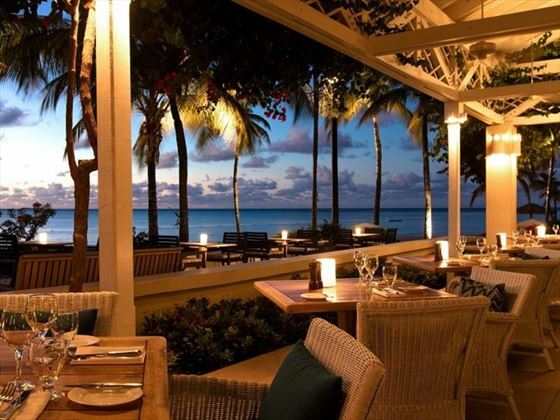 Restaurants range from the classy, colonial-style Estate House serving sumptuous fine-dining dishes, to the more relaxed Beach Shack offering classic Caribbean street food on the sugary sands. Sense, A Rosewood Spa is simply breath-taking. Blending Antigua’s local culture with native therapies and local ingredients, this holistic spa will take you on a rejuvenating journey, using the soft waves and gentle breeze to really relax the mind, body and soul. There are plenty of fun complimentary water sports to enjoy too, and visit between July and November and you may spot endangered hawksbill sea turtles. 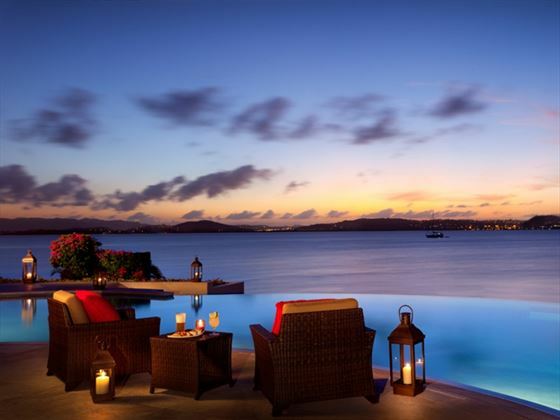 Reachable only by boat, Jumby Bay is located on a private island just two miles from Antigua. The island feels incredibly exclusive and intimate, with two gorgeous white sand beaches and an array of tropical gardens. Rondavel Rooms – Gorgeous, tropical rooms located in octagonal-shaped cottages on the western side of Jumby Bay. Featuring a lovely wraparound terrace with views of the ocean. Rondavel One-Bedroom Suite – Again located within the cottages, these suites are decorated in a classy Caribbean style, featuring a separate living room, a private outdoor garden with a rain shower, and a wraparound terrace looking out to sea. 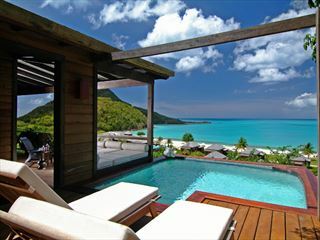 Beachside Suite – These gorgeous suites are seriously impressive, adopting a warm and inviting Caribbean vibe. Featuring tropical flowers, a cosy sitting area that opens out onto the bedroom, a dressing area, and a soaking tub nestled in the private courtyard. These suites are perched right on the beach. Pool Suite – Utterly charming suites, accessed by an antique privacy gate that opens out onto a private courtyard. These suites are exceptionally large, featuring a spacious living area, a separate master bedroom, a private garden with a rain shower and tub, plus an expansive terrace fit with a lovely pool. Rosewood Estate Suite – With huge glass doors on almost every wall opening out onto a wraparound terrace, this one-bedroom suite is shrouded in natural light, and evokes a bright, airy ambience. Featuring a courtyard with a fountain, a colonial-inspired living room, an infinity edge pool with views of the ocean, and a master bedroom with a powder room, and a small courtyard with a deep pedestal tub and rain shower. There’s also a private butler pantry for in-suite dining, and an office. Banyan Villa – A huge three-bedroom, four-storey villa, with plenty of spacious living spaces, a stunning pool, and a tropical lawn that leads on to a hidden beach area. All three bedrooms featuring a walk-in wardrobe and ocean views, and there’s a shaded pool terrace. 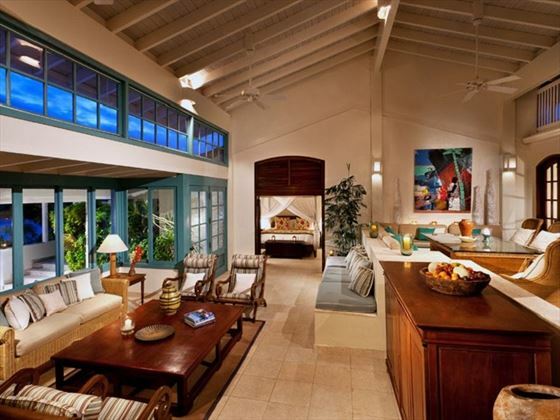 Carisbrooke – Another three-bedroom villa, this time decorated with contemporary Caribbean flair. The open-plan villa features a dining area, a living room, a veranda with a private pool, and three bedrooms all featuring a bathroom with a rainfall shower and a balcony/terrace. You’ll also have direct access to a small beach. 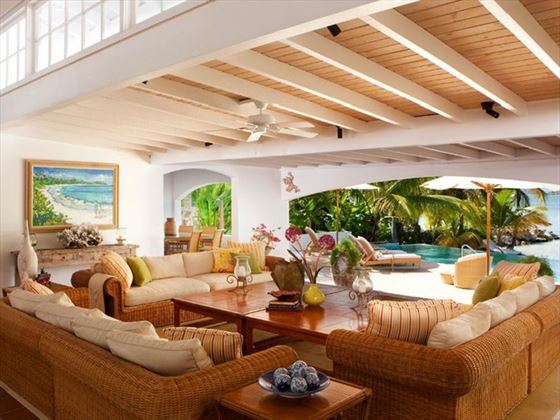 Jabberwocky – A classic Caribbean villa with an open floor plan, featuring a dining area, a living area, three ensuite bedrooms, and an expansive pool deck that leads on to the beach. Doniford Cottage – Located within the three-acre peninsula - Henzell Point, on the southern side of the island. This three-bedroom villa is incredibly private. Featuring a fusion of Mediterranean and colonial décor, an open floor plan, an entry courtyard, a dining area, a bar, a living room, and a covered outdoor dining area that opens out onto the private pool. This villa has the best views of the sunset. 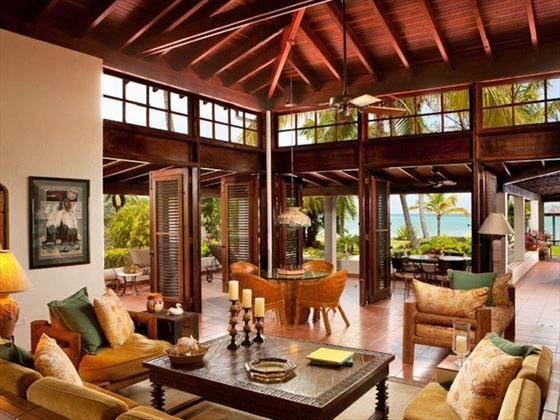 Poinciana – A stunning beachfront villa, featuring West Indian décor, cathedral ceilings, two bedrooms, a modern kitchen, dining area, a family room with a TV, and a living area. The expansive outdoor terrace has lounge areas, dining areas, and a pool. Sandy Cove – An intimate villa where you can step off your large pool deck straight on to the sand, fit with sun loungers and a hammock. The villa has an infinity edge pool, open-plan outdoor and indoor living/dining areas, four bedrooms, and its own slice of private beach. Sea Breeze – A contemporary split-level villa, with four bedrooms, a well-equipped kitchen, a living room, and a formal dining area. All bedrooms have a veranda. The stunning infinity pool wraps around the oceanfront patio, offering an intimate space to relax. Sea Hare – The cosy living area opens out onto the spacious pool deck, with unsurpassable views of the ocean. Featuring a private strip of beach, an infinity-edge pool, three bedrooms, a kitchen, and a dining area. Two of the bedrooms have their own private terrace. Sea Horse – A luxurious three-bedroom villa with plenty of privacy. Featuring a plethora of outdoor and indoor living spaces, two master suites with private terraces, another bedroom, an oceanfront infinity pool, and even its own private staff – including a maid and housekeeper. 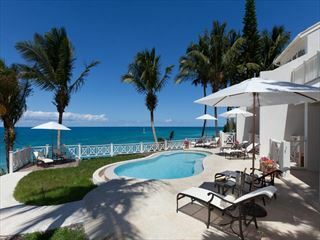 Sea Star – One of the few villas that are nestled on the exclusive Davis Bay Beach Area. The large pool is stunning, as is the entirely open-plan living space with plenty of dining and seating areas. There’s also a kitchen, plus three bedrooms and an outdoor grilling area. Tortuga – You’ll love the huge covered terrace, adorned with charming living and dining spaces, and opening out onto the small pool. Featuring three bedrooms, relaxed interiors, and a private housekeeper. Whispering Palms – This is one of the biggest villas, offering plenty of classic Caribbean charm amongst its four bedrooms, indoor and outdoor living spaces, large infinity-edge pool, private lawn with direct beach access, kitchen, dining area, and family room. 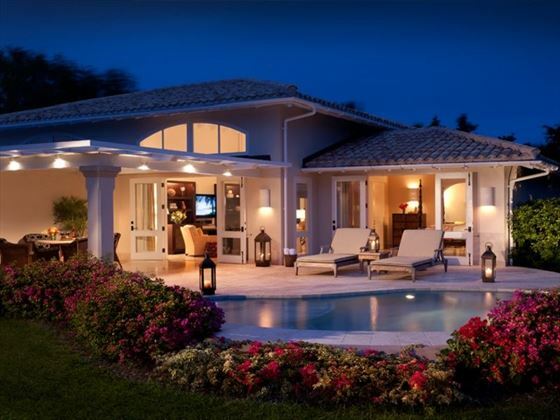 Allamanda – A sophisticated villa featuring a lush landscaped entry, a pool, and its own private beach. The Great Room spans a whopping 40 feet in length, and boasts two seating areas and a dining area for 10, all opening out onto the huge veranda with a pool and direct beach access. There are four bedrooms – three of which are sea-facing. There’s even a romantic viewing tower with a private suspended daybed. Bougainvillea – This villa is perfect for families. This colourful three-bedroom villa overlooks the stunning Jumby Bay, and features a quiet courtyard, floor-to-ceiling glass doors that open out onto the outdoor gardens, a kitchen and a comfy living room. Hummingbird – This three-bedroom villa is located in a quiet and peaceful location. Overlooking Jumby Bay, the interiors are bright and breezy, and the villa features unique artwork, a living area, a modern kitchen, a large patio shrouded in pink bougainvillea, an upper outdoor terrace with gorgeous views of the sea, and a gorgeous outdoor dining area nestled next to the infinity-edge plunge pool. Sunflower – With large wooden shuttered-doors that open out to create an open-air feel, this three-bedroom villa is perfect for those who want to feel al-fresco at any time of the day. Featuring a lush backyard with a hammock, a spacious living area, a well-appointed kitchen, a large patio overlooking the ocean, and a quiet courtyard pool. There are 18 Estate Homes, ranging from four to eight bedrooms. 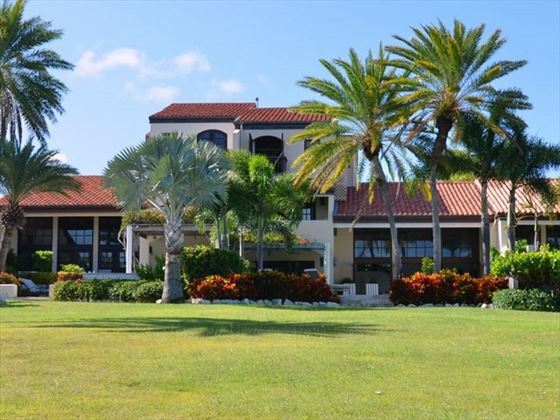 Many feature a plethora of incredible amenities, including their own tennis courts, croquet greens, basketball courts, or even a private beach. The Estate House – A divine fine-dining restaurant serving truly decadent West Indies inspired cuisine, all created with island flavours. Dine on signature dishes including Monkfish with black trumpet casserole and crispy jasmine rice pancake, or Black sea bass with potato confit. This is a renovated 1830 plantation house, which now hosts a restaurant, 1830 Bar, private dining rooms and a wine room. Open Monday, Tuesday, Thursday, Friday and Saturday 6.30pm-9pm. 1830 Bar – Nestled within The Estate House, this glamorous colonial-style bar offers a variety of beverages. Open Monday, Tuesday, Thursday, Friday and Saturday 6.00pm-11pm. The Verandah – A colourful restaurant serving delicious classics created with fresh, seasonal ingredients, including paella and tikka chicken masala, or light tapas. Open for breakfast, lunch and dinner, as well as hosting afternoon tea and the resort’s weekly White Night BBQ party. Open 7am-10.30am, 12pm-2.30pm. 6.30pm-9.30pm. Verandah Bar – A big, vibrant space serving up refreshing cocktails and concierge service. Open 11am-11pm. The Pool Grille – Nestled next to the huge infinity pool overlooking the sparkling ocean, this is a great spot to tuck into casual bistro lunches – including sandwiches, grilled seafood and salad. Fancy a fresh fruit juice or a cheeky cocktail? This is the place to be. You can even order from your lounger. Open 12pm-4.30pm, and 6.30pm-9.30pm (excluding Sundays for dinner). The bar is open 11am-11pm. The Beach Shack – A charming, colourful shack sat right on the beach, serving up flavoursome West Indian fare and local street food, including lobster or chick wraps, locally caught fish and ceviche. Perfect for a casual, grab-and-go lunch. Open 12pm-3pm. 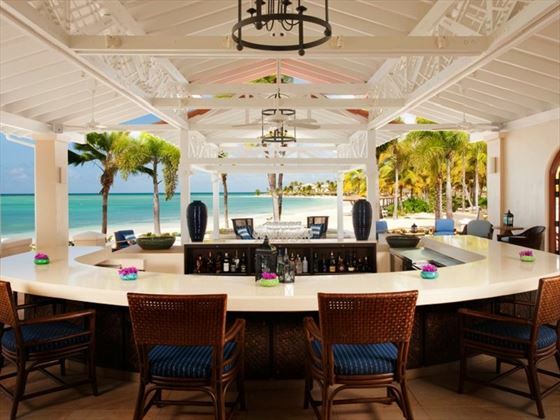 The Beach Bar – Sat right on Jumby Bay Beach, this kooky thatched-roof bar offers cocktails, cold water, and even fresh towels. After sunbathing all day, pop along to the Bar for freshly made sorbets or an ice cream sandwich. Open 10am-6pm. Private Dining – Private dinners can be arranged on the beach, alongside musical entertainment and a personal server, who will present you with wine pairings and the chef’s exclusive menu. Sea-To-Table Dining Experience – Board a private sport fishing charter in search of Mahi Mahi, Wahoo, Tuna and Marlin, which will be freshly prepared by the resort’s chefs and served at the private Chef’s Table. Jumby Bay Beach – A chilled out, half-mile stretch of beach, adorned with thatched bohios (hut) perfect for if you need a bit of shade. You’ll even find hammocks scattered between the palm trees, and the Beach Bar with sorbets and cocktails. Pasture Bay Beach – Perched on the northern end of the island, this beach is intimate and secluded, offering untouched beauty and a plethora of wonderful marine life, including endangered hawksbill sea turtle. The ideal spot for a private, personal picnic. Oceanfront Infinity Pool – Nestled on the far end of Jumby Bay Beach, this lagoon-style pool seems to seamlessly blend into the ocean blue. This is the quieter pool, perfect for relaxation. Verandah Pool – A great pool for families, featuring four lap lanes and adorned with tropical gardens and loungers. Fancy a bite? Indulge in the poolside food and drink service. You could even take part in the aqua fitness classes and poolside reflexology. Sense, A Rosewood Spa – Inspired by the tranquil surroundings, Antigua’s rich local culture and indigenous healing traditions, this gorgeous spa has all you need to rejuvenate the mind, body and spirit. The open-air architecture lets nature in, including the soothing sounds of waves lapping on the shore and a slight ocean breeze, whilst the delightful smell of the tropical gardens sifts through the stone archways. 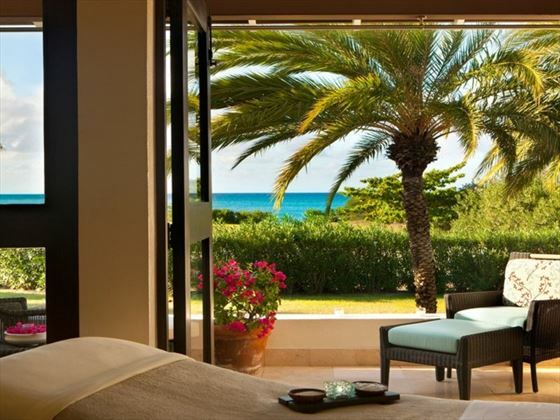 There are five personal spa suites, including a special duet suite, plus lovely relaxation terraces with unsurpassable ocean views. Many of the treatments include native ingredients grown in Jumby Bay’s private gardens, with therapies including massages, exfoliators and facials. Our personal spa highlight has to be the handmade hammocks. Suspended in the hair, all you’ll need to do is relax in your hammock as therapists massage your head, back, hands and feet.